For admirers of fine crystal, there is something magical about the name Swarovski. For over 100 years, this name has stood for top-quality, full cut crystal, expertly faceted and polished to show every spark of brilliance. With Swarovski Crystal gaining in popularity today, we wanted to give you some background on where it came from. It seemed to be a perfect way of bringing together a growing number of individuals with a common interest, those interests ranging from ornaments to jewelry. Swarovski crystal was born when Bohemian, Daniel Swarovski invented an automatic cutting machine in 1892. The company was founded in 1895, when he established a crystal cutting factory in Wattens, which he could take advantage of local hydroelectricity for the energy-intensive grinding processes he had patented. Many Swarovski Silver Crystal lovers believe that the raw material used in the manufacturing of our objects occurs naturally, like rock crystal from which containers and spheres have been carved since time immemorial. Swarovski Crystal is made at the factory in Wattens using basic formulae, perfected by Daniel Swarovski and his three sons many years ago. The quality is dependent on the production method and the processing of the raw material. Both factors play a major role in determining its brilliance and the measure of its value. Swarovski Silver Crystal if fired using a combination of natural minerals and quartz sand, and then cooled slowly to avoid stress and inclusions. We, as crystal admirers, are so grateful to Daniel Swarovski for his ingenuity and hard work in bringing something to society that has given it value and has lasted all these years. You will find many examples of beautiful handcrafted Swarovski Crystal jewelry peices at our website. These beautiful peices are made by designers with talent and a love for Swarovski Crystal. You can also learn about the designers and read their bios on the website. Thank you for taking an interest to learn more about the history of Swarovski. 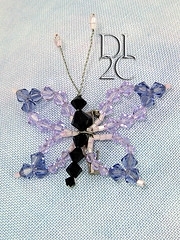 This entry was posted in Crystal Glitz and tagged brooch, butterfly, crystal, swarovski, wedding on August 4, 2009 by admin.